This isn’t a subject talked about very frequently but it’s a big piece of everyone’s art education. There are two similar yet distinct methods of learning to draw & see which I loosely define as realism and constructionism. Only one thread on this topic shows up in Google, but it’s still very a important topic nonetheless. The terms I’ve used merely describe the methods of output and how you achieve that output when drawing from life. Better terms may be optical and sculptural in regards to drawing techniques. But what does this all mean? Let’s examine the two methods and see how they apply to the artistic process. Realist painters mostly work optically in the sense that they’re trying to capture life as accurately as possible. Proportions, perspective, and color values should ideally match reality. But illustrators, animators, and many concept artists prefer the sculptural route. This is where you construct life from shapes, lines, and curves. The goal is not always accuracy, but rather to portray what you need in the simplest manner possible. It’s much easier to draw from your head this way because you can draw with basic forms rather than reference photos. An interesting divide happens for concept artists because they work in both worlds. Concept art should be very realistic, but it also needs to come from imagination. This means when you’re painting concept art you don’t always copy reality. You will need to sculpt ideas from your mind, but also make them as realistic as possible. This is why the method of constructionism also fits best for animators and illustrators. They can draw characters with thin pipe arms or thick muscles, all of which are comprised of spheres and cylinders. The Proko figure course teaches this exact method working from model poses. Illustrators also don’t look for perfect realism, although there is usually a sense of realism. Take for example the artwork of Will Terrell. His style uses powerful exaggeration and caricaturing but in a realistic way. Realist painters are trained not to exaggerate, which is why constructionist/sculptural techniques appeal more to cartoonists. So how does this dichotomy affect your studies? It ultimately boils down to your end goals with art. If you don’t wish to render very realistic paintings then you should start with a constructionist mindset. The free Drawabox lessons are a great starting point. But honestly Proko is the best way to go for premium content because you’ll learn both styles with a slant towards sculptural techniques. 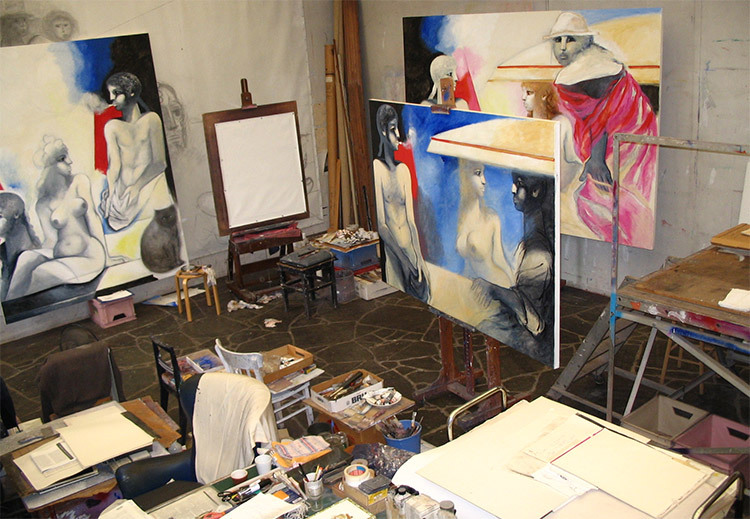 Realist painters follow more traditional methods taught at schools like the Florence Academy. Realism forces artists to look at life methodically. It’s possible to draw or paint a figure with accurate realism without memorizing human anatomy. However sculptural techniques do require much more knowledge because of the imaginary component. Having a model is always useful. But if you plan to exaggerate something you’ll need to know how and why you’re doing it. This requires an understanding of the object(or person) and how it naturally moves. Neither method is right or wrong. That’s very important to clarify because they both have their benefits and drawbacks. In fact most artists eventually learn a little of both methods, but lean towards one or the other. In regards to concept art this is vital to understand because of work output. The biggest difference with concept art is rendering to a complete finish. Animators and illustrators can choose to not render with as much detail. It’s nice to learn and have the option, but it’s not a requirement for those art forms. Concept artists should learn to render with exquisite detail much like a realist painter. But concept artists should also be able to work without being shackled to reference materials. Realism is about seeing accurately and copying without judgement. This involves a lot of looking and measuring to triple and quadruple check your work for mistakes. It can be tedious, especially if you don’t want to create realist art. But the more you practice rendering the better you’ll get. Try not to concern yourself too much with either method at first. The best thing for a beginner is to just draw. As you improve you’ll run into more specific roadblocks and should deal with them as they arise. While it’s important to just get started, you should have some idea of what you want to do before starting. If you want to do anything other than realism then your initial methods shouldn’t be a concern. You can always change your style as you progress. The most difficult aspect is learning to render because this is where detail comes into play. You can exaggerate the lines and gestures, but rendering in detail can rarely be exaggerated. I personally recommend Color and Light by James Gurney. It’s one of the few books concerning realist painting techniques in regards to imaginary concepts. Most of the lessons and techniques you need will be picked up as you practice. Try to draw something from life every day. If you’re new it’ll be pretty bad. But take time to study your work and examine why it’s bad. Great artists eventually learn to teach themselves through self-analysis. If you have more questions or want to follow through with one particular method of schooling then check out this CA forum thread. It has 30+ pages full of links and information debating this topic and discussing the values of both methods.